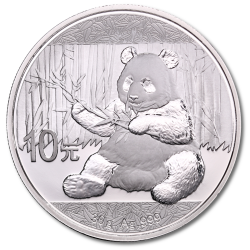 The Silver China Panda is one of the world's best-selling bullion coins and it's favoured by investors as well as collectors. It's one of each year's most eagerly awaited releases thanks to its reverse design featuring the Giant Panda, a symbol of China and one of the world's best-loved animals. The obverse shows the Hall of Prayer in the Temple of Heaven in Beijing. Each Silver Panda has its face value in Yuan and is guaranteed by the people's republic of China. The Chinese Silver Panda made the transition from ounces to grams in 2016 and these iconic coins continue to captivate new and established investors.